As the weather starts to turn, it’s an ideal time to stock up on regular and flavoured waters to keep your customers healthy and hydrated throughout the cooler months. That’s why we are running this Danone waters special between 17th & 23rd September 2018, ONLY! 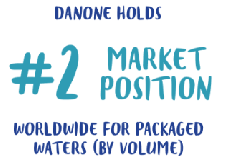 Danone have gathered some great figures that help us account for water demand. The average daily water intake from beverages is 75%, whereas food accounts for 25%. Because waters account for 19% of Danone’s 2017 sales and there is a 2/3 share of natural waters within Danone’s waters business, it is crucial to think about the ratio of natural and flavoured water you are stocking up on when it comes to your business. Showcasing Delicious Sweet & Savoury Snacks from Pladis! With popular classics from Pladis this week, including McVitie’s Digestives, Hobnobs, Jaffa Cakes, Mini Cheddars and more, you are sure to be ahead of the snack game! Available between 10th & 16th September 2018 only, it’s time to grab these scrumptious biscuits now to make POR’s of 30% and above. If you are keen on stocking a fast-growing and dynamic brand that will definitely increase your sales, Mini Cheddars are one to watch out for. A brand worth £63m, with 17% faster growth than the entire crisps and snacks category (Nielsen - June 2018), Mini Cheddars have introduced new Chilli Beef and Red Leicester varieties that will have your customers coming back for more.